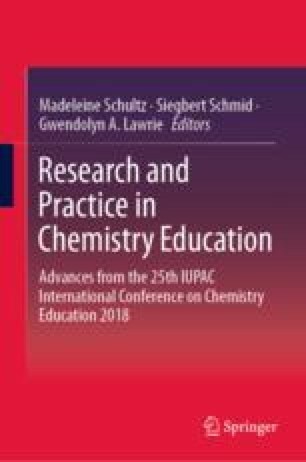 This chapter presents a teaching approach that focuses on student-generated contexts and how its use can reframe both chemistry teaching and learning. The eight phases of the Student-Generated Contexts Teaching Approach (SCTA) model—Introduction, Context Generation, Decision, Implementation, Presentation, Discussion, Reflection, and Context Regeneration—are described in terms of individual and collaborative context generation. To determine the nature of the contexts the students themselves generated, decision logs, reflection papers, and audio-recording transcripts were content-analyzed. The emerging themes on the nature of the contexts are: (1) source of the context; (2) level of the context; and (3) student engagement in the context. Sixty-five Grade 10 chemistry students comprised the two heterogeneous intact classes: one group was exposed to Individual Student-Generated Contexts Teaching Approach and another group was exposed to Collaborative Student-Generated Contexts Teaching Approach. The topics covered in the study included acids and bases, neutralization reactions, reduction–oxidation reactions, electrochemical cells, and electroplating. In this chapter, the contexts generated by the two groups are compared in terms of fluency, flexibility, and complexity. Finally, the benefits of using student-generated contexts in the teaching and learning of chemistry are discussed. Thank you very much to: Philippine Department of Science and Technology for the Ph.D. Scholarship; University of the Philippines Diliman Chancellor Michael L. Tan for the Dissertation Aid and the Research Dissemination Grant; University of the Philippines Diliman Office of the Vice-Chancellor for Research and Development through its Vice-Chancellor Fidel R. Nemenzo for the Dissertation Grant; and U.P. College of Education Scholarship Committee for the Dissertation Grant. Child Trends Data Bank. (2013). Science proficiency: Indicators on children and youth. https://www.childtrends.org/wp-content/uploads/2012/10/10_Science_Proficiency.pdf. Acccessed December, 2018. National Academy of Sciences. (2017). National science education standards: An overview. Retrieved from http://books.nap.edu/html/nses/htmloverview.html. Nelson, G. D. (2001). Remarks on the release of the NAEP 2000 science assessment results. AAAS Project 2061. American Association for the Advancement of Science. Retrieved from http://www.project2061.org/newsinfo/press/rl011120a.htm. Rayner, A. (2005). Reflections on context-based science teaching: A case study of physics for students of physiotherapy. In Uniserve science blended learning symposium proceedings. Retrieved from http://science.uniserve.edu.au/pubs/procs/wshop10/2005Rayner.pdf. Szeto, A. K. (2008). Teaching science content, concepts and processes with contexts. In Ideas on Teaching. Centre for Development of Teaching and Learning, National University of Singapore. http://www.cdtl.nus.edu.sg/Ideas/iot100.htm Accessed December, 2018.